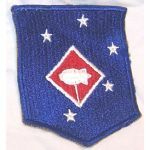 WWII - Occupation Era 1st Division Patch. German silk woben. Unused. 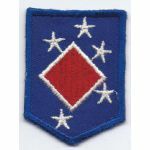 1st MAC Aviation Engineers Patch. Fully machine embroidered. Used. 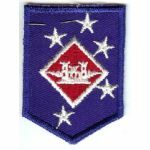 WWII 1st MAC Aviation Engineers Patch. Machine embroidered on twill. Unused. WWII US Marine Corps 1st M.A.C. 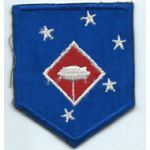 Barrage Balloon Battalion Patch. Fully machine embroidered. Unused. 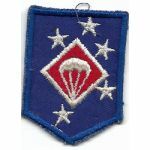 WWII US Marine Corps 1st MAC Barrage Balloon Battalion Patch. Fully machine embroidered. Unused. 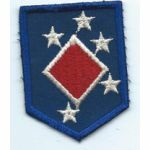 WWII 1st MAC Defense Battalions Patch. Fully machine embroidered. Unused. 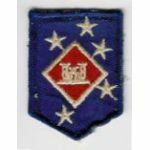 WWII US Marine Corps 1st MAC Headquarters Battalion Patch. Machine embroidered on twill. This is the super dark blue twill variant. Unused. 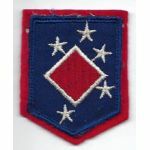 WWII 1st MAC Headquarters Patch. Fully machine embroidered. Used. 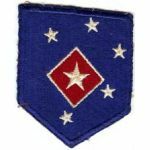 WWII 1st Marine Amphibious Corps Headquarters Patch. Machine embroidered on twill with a cheesecloth like backing. Unused. 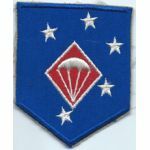 WWII US Marine Corps 1st MAC Parachute Battalion Patch. Fully machine embroidered. Unused. 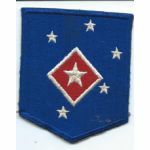 WWII US Marine Corps 1st MAC Raider Twill Small Size Patch. Twill background with machine embroidered details and a cheesecloth like backing. Unused. 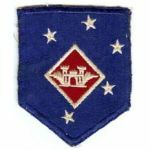 WWII 1st Marine Amphibious Corps Service & Supply Patch. Machine embroidered on twill with a cheesecloth like backing. Unused. WWII US Marine Corps 1st M.A.C. 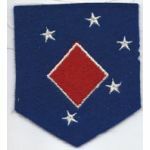 Service Of Supply Battalions Patch. Fully machine embroidered. Unused. Neat variant in that the star is off center. 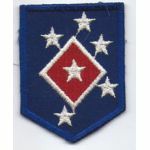 WWII US Marine Corps 1st MAC Service & Supply Patch. Fully machine embroidered. This is the variant with the thick inner white border. Unused. 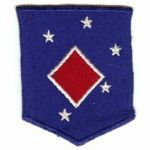 1st MAC Service Of Supplys Battalion Patch. Fully machine embroidered. This is the variant with the thick embroidered white star. Used. 1930's - WWII 1st Machine Gun Battalion DI. About an inch tall. Brass background with enamelled details. Dondero hallmark. Pin back.